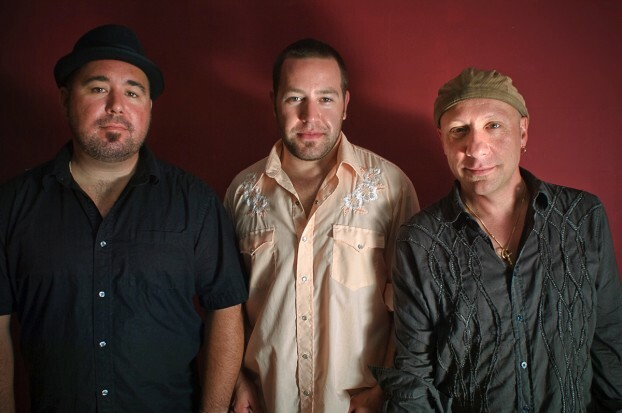 MonkeyJunk, from left to right: drummer Matt Sobb, frontman Steve Marriner, and lead guitarist Tony D.
Defining the unique brand of blues from the true north strong and free is a tall order. In typical Canadian fashion, it’s a mish-mash of different influences and styles, borrowing from and putting a new spin on traditions from Chicago, Memphis, New Orleans, among others. Case in point: Ottawa-based band MonkeyJunk. The trio consisting of drummer Matt Sobb, lead guitarist Tony D, and frontman Steve Marriner has been a staple of the Ottawa blues scene for nearly five years, and in that short time they’ve got their paws on fifteen Maple Blues awards and a Juno for Blues Album of the Year in 2012. They’ll be swinging into Saskatoon to play the Jazz Festival on Sunday, June 23 at the free stage. We recently caught up with vocalist and baritone guitarist Steve Marriner over the phone to chat about the band’s influences, their creative process, and their upcoming, currently untitled third studio album. And write cool tunes they do. All hailing from Ottawa, the blues has been home base for the MonkeyJunk guys since they each got into music in their teenage years. For Marriner, 28, playing the blues has become second nature. Tiger In Your Tank, MonkeyJunk’s first album, was released in 2009. “It’s even more kind of a traditional bluesy record,” said Marriner. And while still referring back to their bluesy roots, the band shifted gears in 2011 with To Behold. That album, according to Marriner, was a deliberate step outside their traditional, established sound, aimed towards a newer, more original feel. Building on this momentum, pushing towards a hip, modern sound has been the driving force for their next album as well, due out on September 24 of this year. The band’s will to explore new sounds stems from not wanting to be shoehorned into one specific genre of music. Marriner and his colleagues invested much more energy producing their latest record than the previous two. It’s recorded analog onto two-inch tape, and yet, says Marriner, “the sounds we came up with are what I consider to be more full. A lot more bottom end, bigger drum sounds… but still vintage sounding.” The band also emphasized vocals, backup singing, and more thought went into the form and structure of the new tracks, especially how each chorus fits into the song. Putting out a new album, with a newer sound, can be a tricky task for any band to pull off successfully, but Marriner’s not too worried. MonkeyJunk’s new album hits record stores and the Internet on September 24. You can also check them out live this Sunday at 9:00 at the Jazz Festival Friendship Park free stage.